Is addiction the unspoken side effect of chronic illness? I have enough drugs in my house to kill me. Probably three or four times over. And that’s ‘normal.’ That’s just how it is. 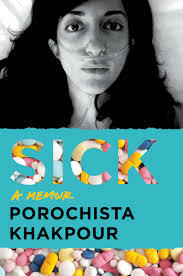 Porochista Khakpour’s memoir tells the same story. Hers is surreal, feverish, and addictive – reflective of her medical and emotional experience. The raw, chaotic narrative crashes back and forth in time, a choice I think leaves the reader intentionally confused. For much of it, Khakpour is in a state of confusion, attempting to chase diagnoses and simultaneously avoid them. She relocates then relocates again, moving for health, for jobs, for boyfriends. In her late teens, Porochista moves from LA to New York to go to Sarah Lawrence. She’d always romanticised that city, romanticised illness, romanticised addiction. A cherished aunt who visits the younger Porochista from NY is described as being enviably thin and beautiful – an aunt who later dies from a brain tumour. Porochista falls into the world of illicit intentionally and easily. Weed, coke, hospital admissions from bad trips – it appears that she is attempting to disappear. It is difficult to discern if this is a mode of enjoyment, or simply one of escape. Lyme Disease is difficult to diagnose and even more difficult to treat. Because poor mental health – insomnia, eating disorders, even psychoses – are symptoms of the illness, those are seen as cause, not result. It’s easier to prescribe antianxiety medication than it is to look deeper. It didn’t take long for Porochista’s addictions to illegal substances, to morph into dependence on these new drugs – benzodiazapines, neurontin – which provided relief, mainly in the form of sleep. It didn’t escape my attention that I have those same prescriptions – nor that I was battling withdrawal from the steroid prednisone while I lay on the couch with her book, shivering under a blanket even though it’s been 28 degrees. My slow tapering of prednisone – monitored closely by two doctors – is a painful process I’ve spoken about several times. I was originally prescribed 40 milligrams when I was in hospital almost six years ago, which dropped to 20 when I returned home. Between 2013 and 2017, I had several months here and there when I wasn’t on it, but when my illness flared badly enough, my doctors would return to it. Never in the same high doses – I think 15mg was the most I had – but enough to lower my pain and heighten my energy. Prednisone feels every bit like you’d expect a steroid to feel. On higher doses, it feels like invincibility. In fact, it’s only an invisibility cloak on the symptoms that are always there. It is usually prescribed for short periods because of its addiction profile, but my body’s dependence on it made that difficult. Removing the drug only caused my illness to return with a vengeance. A friend who tapered off too fast landed in ICU with multiple organ failure. It’s not to be fucked with. So, it’s taken me fourteen months to go from 15 milligrams to 1 milligram, as of last week. Following doctor’s orders – and listening to my body – I stepped down only 1/2 at a time, every two-four weeks. It’s been frustratingly slow and incredibly painful. Each drop in dose would cause a sharp rise in my pain, and render me too exhausted to properly function. Because prednisone interacts with the endocrine system, withdrawal also has a hormonal effect – like PMS, on steroids. Literally. I would yell and cry compulsively. My mood would drop out and I’d end up in bed, refusing to interact with anyone. After a few days, my body would relearn that it was in control, and I’d get back to my ‘normal’ – which is to say, all of the above, but controlled. However, as the dose has gotten smaller and smaller, the withdrawal bounce has gotten bigger and bigger. Now, I’m dropping 1/4 of a milligram a month. With the last drop, it took just a couple of days before the symptoms hit. My entire body ached. I could barely keep my eyes open, let alone work. My joints felt swollen, my muscles tender. I sweated, sitting in a cold bath with my head on my knees. Brain fog wrapped around me like a blanket and I felt heavily disassociated from daily life – from the people who were trying to help. 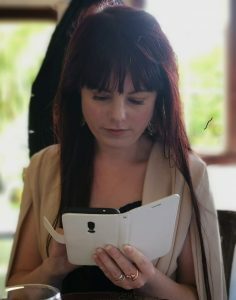 It was like staring at a photo of someone and being dimly aware they were concerned about you, but there was no way to emotionally connect with that. This was the first time in this particular withdrawal process that I felt afraid. It was the first time it felt like previous antidepressant withdrawals, where I became unsafe and very unwell. I tried to remind myself this was withdrawal and that it would pass soon, but it didn’t feel temporary. It felt like my brain was broken. During this time, I read Porochista’s book. I thought about the idea that addiction is a complication of chronic illness. That it’s the unspoken, unavoidable side effect. I spoke to someone at the NZ Alcohol and Drug Helpline. I asked her what the difference was between medical dependency and addiction. She asked me if my drug use interfered with my life, my relationships, my health. It’s hard to answer these questions when I’m not asking because I’m addicted to recreational drugs. I’m asking because I want to know if my prescriptions make me an addict. I realised through that that my fear was more about stigma than anything else. I didn’t want to think of myself as an addict, even though yes, in technical terms I’m addicted to my prescriptions. But they don’t interfere with my life – they help me lead it. And there was an even more difficult question to answer – are we vilifying people who take drugs, when we have no idea how they ended up addicted? Medicine is a necessary part of life for many – most? – people with disabilities and chronic illnesses – mental or otherwise. Accepting that is part of the framework we need to be as healthy as possible. This entry was posted in About illness, Mental health, Uncategorised by writehanded. Bookmark the permalink.